Cause I went from negative to positive and it’s all… good…. A comment from a previous post sparked lyrics long since forgotten. A young man in my class beggin to play Biggie Smalls and Eminem as a form of poetry and then he promised he would explicate rap. My first time hearing rap music and yes, I was skeptical. 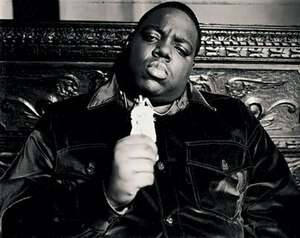 Now Biggie is reaching out the grave smacking me for forgetting. Yesterday, I was in a foul mood. Up all night listenin to the neighbors dog yap “2am, 3am, 4am, 5am listening to my stupid neighbor’s dog!” I think is how I expiated on Facebook. My friends all clicked “like” they knew! Then came an old old friend and said “2am, 3am, 4am, 5am listening to my wonderful neighbor’s great dog!” – and I went from a negative to a positive and it was all good. I am always saying “we are what we think”. I avoid this neighbor’s negative talk and sometimes (and that is a stretch) I try to think good thoughts for him. I am so blessed to live in Montana, on an incredible ranch with the beautiful Little Bighorn river flowing by my front door and a well stocked lake in my backyard. My horses are out back and I can hunt dove and pheasant every day. 19 square miles of 4wheelin, hunting, hiking, camping…ya get the picture? why get frustrated with my neighbor? Thanks Biggie for reaching out! Biggie SmallsBrooklynEminemFacebookFulton StreetHip hop musicMontanaNotorious B.I.G. right on – well said!